December 28 [+mat], 30, 31 1985 – January 1, 2, 3 & 4 [+mat] 1986. IN the words of one of the show’s most famous songs, it will be an actor’s life for Wick Theatre Company when they perform Pinocchio at the Barn Theatre, Southwick, the week after Christmas. Joan Bearman is the producer of the company’s seasonal offering, which features faces both old and new. Eleven-year-old Natalie Colgate and Lynsey Collis, aged 13, share the title rôle of the ever-popular puppet, while, on the experience side, Ronald Cheesman plays Gepetto and Ray Hopper is Jiminy Cricket. Pinocchio opens at the Barn on Saturday December 28, with matinee and evening performances. It continues from December 30 to January 1 inclusive and closes on Saturday, January 4, when there will again be both a matinee and evening show. A COMBINATION of slick acting and dramatic special effects ensured the success of Wick Theatre Company’s glittering pantomime at the Barn Theatre, Southwick, last Thursday. Youngsters can be the sternest critics, becoming board and fractious if the pace falters, but this performance of nursery favourite Pinocchio kept both children and adults in a happy and appreciative mood. One of the main strengths of this production was its fast-moving action. The scene changes were speedy, the dialogue slick and the traditional songs full of vitality and life. One of the most colourful and entertaining performances came from Ray Hopper as the old-time favourite, Jimmy Cricket. His rich singing voice and well-developed sense of fun did full justice to the part, which proved a hit with the large audience. Another virtuoso performance came from experienced and popular Betty Dawes. Her interpretation of the Blue Fairy showed all the wisdom and benevolence that is associated with the part. Despite the diminutive stature, Natalie Colgate gave a towering performance as Pinocchio blasting out the songs and dialogue with verve and enthusiasm. She shared the part with Lynsey Collis, who appeared in half of the public performances. Another young actor who showed a talent beyond his years was Daniel Wright as Pinocchio’s young friend, Lampwick. He also shared his rôle, alternating with Mark Wright. Adding charm and colour to the activities was Ronald Cheesman as the loveable puppet maker and Douglas Tucker as Antonio. Also worthy of special praise were Dave Davison [fire eater], Susie Thompson [Harlequin], Trudy Nash [Columbine], Sheila Wright [Mr. Fox], Margaret Faggetter [Cat], William Warman [Coachman] and Martin Camp [Ringmaster]. Another of the panto’s hallmark were the special effects and the scene inside the whale was particularly memorable – due to authentic props and clever lighting. 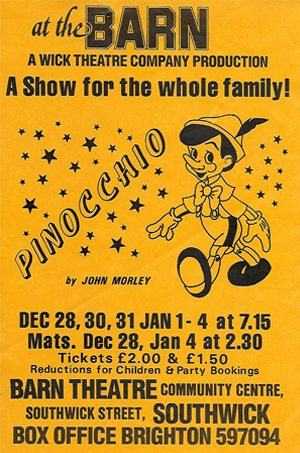 “Pinocchio was a contrasting offering to our audiences, but one which maintained the great sense of enjoyment. Joan and her large team had worked hard and long at rehearsals, and it was a joy to see such a variety of characters and ages represented in this production. [We hope we get the chance to see some of the talented youngsters back on stage soon]. A weekly paper, first published as the Brighton Gazette, Sussex and General Advertiser or Worthing, Eastbourne and Hastings Fashionable Chronicle on 22 February 1821 by E. H. Creasy, in premises beneath Donaldson’s Library at the corner of Old Steine and St James’s Street Brighton. The offices later moved to 168 North Street, and from 1835 it was printed in a building adjoining the Central National Schools in Church Street. From 1852 it was published at the Pavilion Dormitories behind North Street, but the Gazette was later acquired by the Southern Publishing Company. On 2 April 1938 it became the Brighton & Hove Gazette. The paper incorporated the Southern Weekly News from 19 November 1965, and continued as the Brighton & Hove Gazette and Herald in 1971, having incorporated the Herald. The last edition was published on 9 March 1985 when the Gazette was itself absorbed by the Brighton and Hove Leader, launched as a free weekly on 25 June 1981.